Ceiba speciosa is the new name for Chorisia speciosa, while not yet universally accepted by the trade Ceiba speciosa is the name most often used. Ceiba speciosa is spectacular in all seasons. 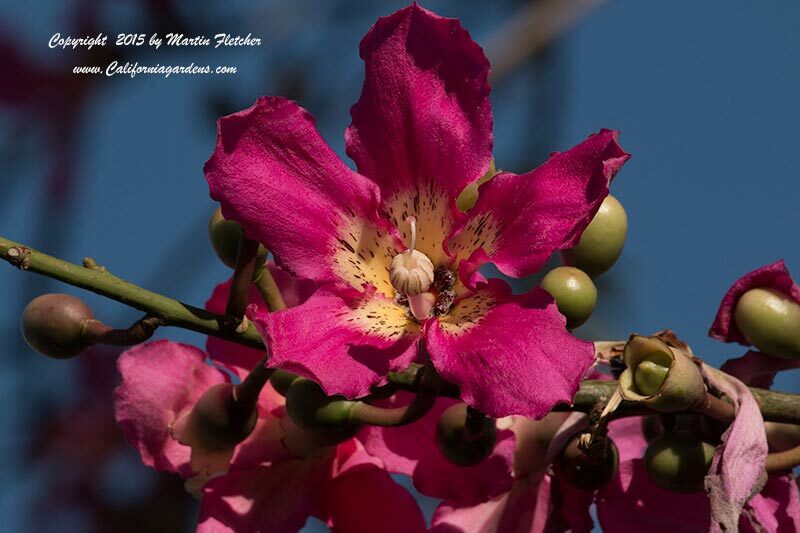 The Floss Silk Tree produces a wealth of pink and white blossoms from Late Spring into the Fall when the tree is only sparsely covered in leaves. The pale green trunk of Chorisia speciosa is often clad in some of the most impressive thorns. Surely this would make Baloo happy. Ceiba speciosa trees can survive cold nights that dip into the teens but all of the flowering wood will have been burnt off. Best to plant in areas that stay 25° F or above during the coldest parts of Winter. Ceiba speciosa is native to Brazil. The Floss Silk Tree can survive in moderately dry conditions but likes good garden conditions and with them can grow up to 40 feet tall. Flowers and foliage of Ceiba speciosa, Chorisia speciosa the Floss Silk Tree. High resolution photos are part of our garden image collection.